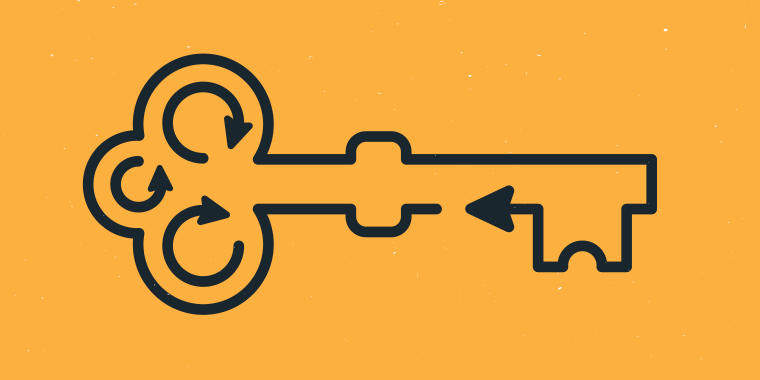 A lot of e-learning developers think of motion paths as a way to move objects across the screen, from one location to another. And while that’s certainly important, the motion paths feature in Storyline 2 is also a great way to introduce interactivity to your project. This interactivity is possible because of the triggers associated with motion paths. Let’s dive in and see how. 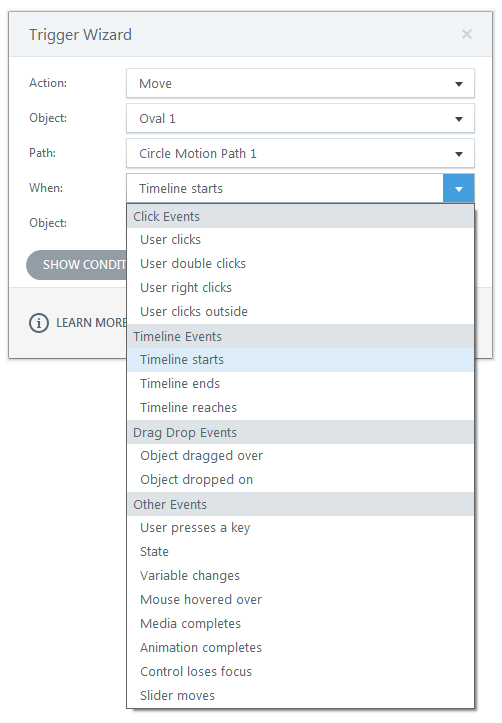 When you add a motion path in Storyline 2, a “move” trigger is automatically created and is set to occur when the slide timeline starts. You can see this trigger in the image below. For example, you can trigger a motion path animation by clicking on an object, or when a variable changes or a piece of media completes, or when the timeline reaches a certain point, or … you get the picture. There are lots of options for triggering motion paths, which also bring interactivity to your project. Let’s work through a scenario. Say you want to create a lesson on physics illustrating the relationship between the distance a cannonball travels and the angle of the cannon. Just attach various motion paths to the same cannonball and then link each path trigger to different buttons the learner can press. Boom! That’s interaction. 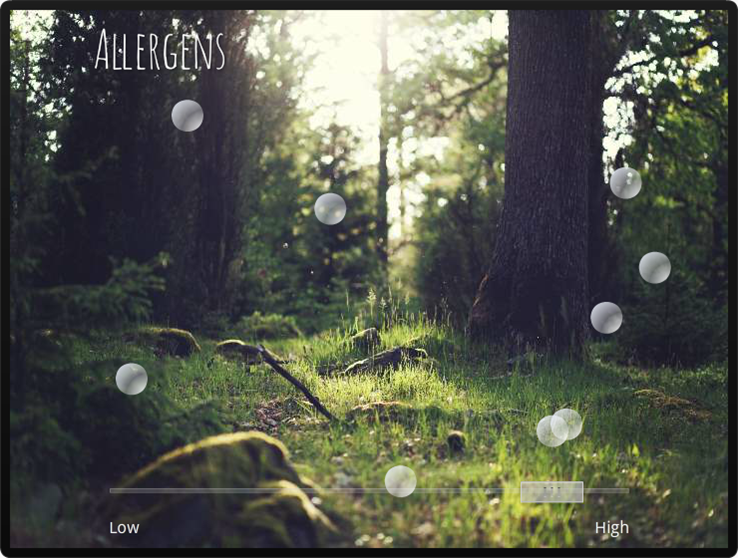 How about a visual demonstration of allergens in the air? In this example, you can move a slider to increase and decrease the number of objects floating about the screen. And this is just the start! There’s plenty more about motion paths to explore in Storyline 2, so if you haven’t downloaded the trial yet, click here to get started now. Happy discovering! You think you've been clever enough to work it all out and then someone tells you about looping motion paths! Thanks Mike, I enjoy your 'quirky' presentation style! Thank you! Saw a brief description at the presentation at DevLearn 2014. This was very helpful, not to mention entertaining! Thanks Kristine! And do let us know if you have any questions! This was a great intro to using the new slider feature and motion paths! Thanks so much! How do you pause a Motion Path at the loading of a slide, and then trigger its motion when a user correctly answers a question? I have been playing with this and trying to use a Variable that makes the object move if the variable changes. I also have set the timeline to pause the timeline which stops the animation on the motion path, but I cannot get it to move once the Correct button has been pressed. You are a rock star! Not just using Storyline but as a teacher! I'm trying to get a motion path object to work, and it's behind a shape that is serving as a mask. But it shows up in front of the object. How does one fix that? This is great, thank you Mike!